Winter Activities - Joyful Toddlers! OK, many of us are settling into winter. It’s cold, it feels like so much effort to get out the door, but if we don’t go out, we end up with crazy energy in the house. And we have three more months to go! This is only the beginning! How will we possibly get through? Outside Play My first piece of advice is to get outside to play AS MUCH AS YOU CAN! Try to do it every day, and make sure you actually do it more days than you don’t. 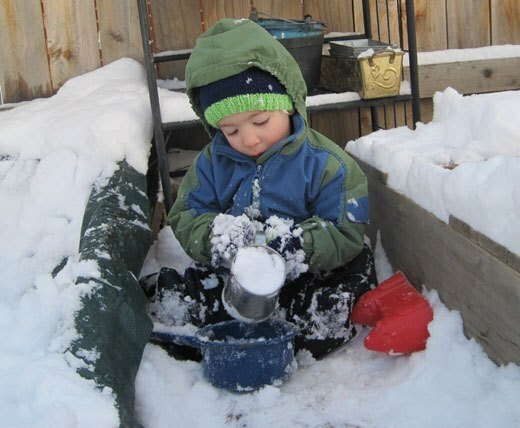 Toddlers enjoy winter weather if it becomes a regular part of their life. It makes them robust and healthy, and it makes indoor time SO much more enjoyable. They won’t keep their mittens on? Use adult-sized SmartWool socks, put over their hand and up past the elbow. They’re quite roomy inside and actually don’t seem to make children any more awkward than any other type of mitten. Once kids build up the endurance to play outside in cold weather, they will love it. At Rainbow Bridge we have a basket of “borrow mittens” that children can choose from if they forget their own, or their own are too snowy, and that basket always stays out long past the time the snow is all melted, as the children actually enjoy wearing them by the time spring comes along. Some children will change them every ten minutes or so, like outdoor dress-up clothes. Make a special activity of coming in out of the cold. Come inside, take off wet snowpants, and do some special snuggling to warm up (although often you’ll feel very warm already, just coming in!). I love heating up apple cider and letting the children shake a dash of cinnamon on top. Or chamomile tea is also lovely. Another lovely connecting activity for chilly days is to do a lavender foot bath: simply put two or three inches of warm water in a large mixing bowl, along with a drop or two of lavender oil. Set the child down on a child-sized chair, take off their socks and roll up their pants, and put their feet gently in the water. Massage their feet in the water, singing a sweet song (I like to sing “Lavender’s Blue, Dilly Dilly). Then lift their feet out, put the bowl aside, and wrap their wet feet in a nice fluffy towel. Put lotion on your hands and rub their feet and legs, before putting their socks back on and giving them a kiss. Kids LOVE lavender foot baths. I will have children sit and wait patiently for twenty minutes in order to get their turn. This is also a nice activity to do before naptime. Inside Play On days when you don’t make it outside, it’s important to give children some way to express their big energy. Think about your day, and think about alternating big energy with quiet energy. I’ve found that directing big indoor energy is helpful, because then it doesn’t bother me. And the kids love me loving their big energy, instead of always trying to tone them down. Follow the Leader is a great game, if you have a group. Also “trips to the zoo” where you go to the zoo and you become each of the different animals, a big elephant stomping around, a kangaroo hopping here and there, a zebra running, a meerkat digging, a sea lion rolling around on the floor. A similar game I learned goes like this: “I traveled over land and sea, I met a man who said to me/I met a man who said to me, oh where do you belong to?” Then, “I belong to hopping land, hopping land, hopping land. And anyone who can hop like me, why they belong to hopping land.” Then you go to spinning land, jumping land, crawling land, bear-walk land, etc. If you have only one child, you can still play the games above, but there are more options, too. When a child has big indoor energy, they don’t HAVE to run; you can help them get the same effects by any sort of play that joggles them, jars them a little, bounces them, spins them or puts their head below their knees. So, pick your child up and put his body in front of you, legs around your waist. Holding him securely, lean him over backwards and swing him gently, saying, “you’re upside down! You’re upside down! You’re upside down!” Then bring him up. Then ask him, “Again?” and do it again. Most children love this game, and will want to do it five or six times before they start to tire of it/get dizzy. Another great head-above-the-knees activity is wheelbarrow walking, where you pick up the child’s feet and have them walk on their hands. The littlest ones I hardly put any weight on their arms, but the bigger children, I really make them work! We will go all the way across the house this way, from one place to another. One hint about these “big energy ” games, you can’t expect to play them for a minute or two and then stop. You must be willing to put in a solid ten minutes of big energy, otherwise you’re merely opening a big can of worms. If you start the big energy, you must follow through. Play a variety of these games and watch your children carefully: they will love these games, and want more, and want more. Eventually they will still want more, but you can tell they’re starting to slow down. Keep going a little bit longer, and then transition from those fun big games into a quieter activity: read a book together, or set them up coloring or playing with a toy/game that they love. Many children, if they’ve gotten a big enough dose of these types of energy games and are feeling satiated, will be able to sit and color at the table for quite a long time afterward, as you do something separate nearby.